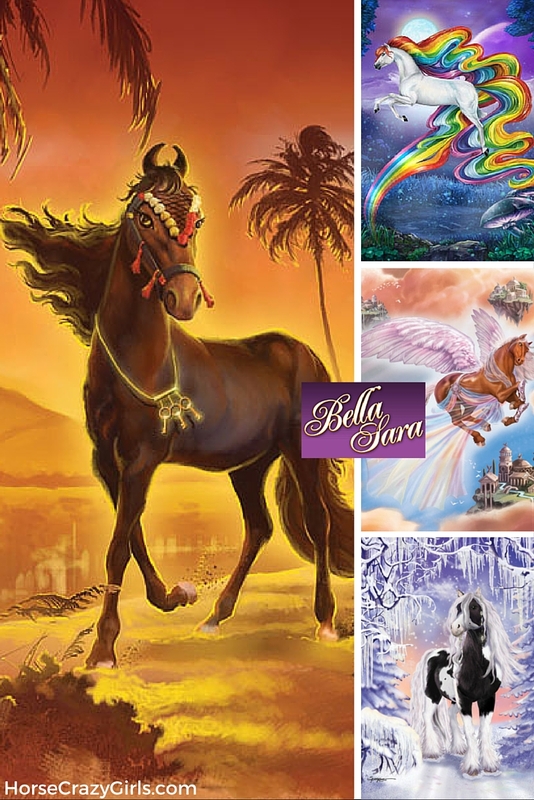 Bella Sara is an online game that you play by getting trading cards with different horses. It reminds me of a cross between Webkinz and Pokemon except with horses! There are different sets of cards, including Northern Lights, Ancient Lights and Native Lights. The newest ones are called Starlights. Some of the horses are really unique and beautiful. It was created by a social worker in Denmark who wanted to create a game for girls. Her daughter's name is Sara and Bella was Sara's first horse! Step One: Play Bella Sara here! Step 2: Come back here and share your review of Bella Sara here! Step 3: If you’re good at this game, please be sure to share your tips for playing Bella Sara here! Step 4: Do you need help? Ask your question if you are having trouble with something in the game so other horsecrazy girls can help you. Step 5: Find lots more fun online horse games for girls here! I think it's okay. I have a lot of Bella Sara cards and really cute horses but my computer is slow so I'll just say it's pretty good. I really like bellasara! It's really fun! Bella Sara is SO much fun! I have like 110 magical horses! I just got BELLA! PS: Can you breed on bella sara? Question About Training Your Horses on Bella Sara? i think bella sara is cute and awsome i collect the bella sara cards now but all i can say is bella sara rocks and it is awesome! doghorse1996, I love this game. Where it says activate card type in vjnm-k8ux-u6u2 You will have two horse names Aurora and Rimfaxe. Thumbs Up for Horse Lovers! i love bella sara!! bella sara is a great site for girls or BOYS! i may have about 50! i am 11 so the site rocks!! I love Bella Sara. it has gotten so much better. the graphics are great and I love the cards. I have 28 of them. Bella Sara is the best game I have ever played. It's so hard to find a good horse game, but it's easy when you look here. DO YOU NEED HELP WITH BELLA SARA? SHARE YOUR REVIEW OF BELLA SARA! Tell us what you think of Bella Sara. Just use the comment link below to share your review. Bella Sara - You will love it! SHARE YOUR TIPS FOR PLAYING BELLA SARA! Are you good at the horse game Bella Sara? Share your tips, strategies or cheats for this game here. Just click on the comment link to add your tips. It's ok, but it would be cool if you could do a lot more with your horse like show jumping and dressage rather than just looking after it. I have been playing for a long time and I love the game. I have many horse friends and lots of cool stuff. I really like Bella Sara because it is like a friend to me. I don't have many friends and this game is quite fun. I have foal named golden honey on Bella Sara and I have like 1000 cards. My best card is Bella and I have Bella's babies. I wish I had a real horse! I <3 Bella Sara it's so cool! In my opinion, the game is very good! REALLY slow to load it may just be my computer but I think the game is good. I also have read one of the Bella Sara books. Summer lily that's my horse. Bella Sara is pretty cool. I mean it's not the greatest thing in the world but I like it. I think that its a pretty cool game. Its not exactly my fave though. I need cards to play Bella Sara! I wish that the ponies grew up. I'd love to watch mine grow. I LOVE THIS GAME! Bella Sara is sooo cool!! I think it rock!And it always has something new for us. super game:) if you love magical horses you will love this game! i love bella sara so much. i love my horse! I recon this game is fun. Do you? i love bella sara. it's awesome.i play it every day.i'm playing it right now. This is a very well built site and will keep you entertained for hours. This is the best game I play it every day. I want to play it right now! I love BellaSara! It's very interesting and fun! I can't wait to buy more trading cards! It's fun except it needs a little improvement. Find more horse games to play here!